All cards have been purchased via the Amazon.com website. I was so happy to get the email saying I was a winner. Congrats to all winners. I was totally surprised today when I opened an email that said I won a prize. I was able to get a gift set I have had my eye on for quite awhile....ty ty ty. The Dragon in the Garden sounds like a fun read. On Apr 01, 2016, Violet Bick said: I think my TBR pile is going to tip over! I found so many new books I'd love to read: Crystallum, Confessions of a Punk Rocker (and the other Nessie Strange works), The SHIVA Syndrome, Wild Man's Curse, First Light, Downfall (and the other Lund books), and others. I found a lot of new authors that I would like to read their books. Kym Roberts and Julieann Dove are two of them. I am looking forward to reading The Dragon in the Garden. There are so many good books/authors. Some I would like to read are those of Jennifer Faye, Cat Schield, Kym Roberts, Zoe Dawson and Skye Jordan. On Apr 01, 2016, Hitherandthee said: So many to choose from!! There are so many good books to choose from in here, but the ones I'm really looking forward to reading are A Deadly Truth by Joyce Proell, What a Duke Wants, by Amy Quinton, and most especially A Pirate's Revenge, by Meg Hennessy! On Apr 01, 2016, proudarmymom said: So many great books! The Dragon in the Garden - The Watcher Rising Series, #1 looks really good. So many reads added to my TBR pile!! Can´t wait for my chance to start reading either of them. I love discovering new authors! I can't wait to read books from Alan Joshua and Felicia Stevens! On Mar 31, 2016, Spiritofnlmk said: So many good ones to choose from! The ones that really grabbed me were A Pirate's Revenge, Strategic Alliance, First Light, What a Duke Wants, and The Fearless Highlander. Found a couple new books to read. Always love these book hunts. On Mar 31, 2016, Sable said: Too many great choices. So many to choose from. Going to the Dogs starter set. I'm looking forward to checking out Confessions of a Punk Rocker by Nessie Strange, A Duchess in Name by Amanda Weaver, The Dragon in the Garden by Erika Gardner, Doors by Joanne Renaud, What the Duke Wants by Amy Quinton, Trapped by Alison Aimes and The Champion of Barésh by Susan Grant. I already have Tempted by her Webmaster by Normandie. I just have to move it up the chain. I already have The Fearless Highlander by Amy Jarecki and Relentless by Skye Jordan on my list. The Draig's Woman by Lisa Dawn Wadler sounds REALLY good as does What the Duke Wants, A Pirate's Revenge and A Duchess in Name. So many Great Books and Authors, here is a couple i would love to read, Downfall by S.D. Wasley , Wild Mans Curse by Susannun Sadlin , Crystallum by Laney MaMann , The Dragon in the Garden by Erika Gardner..
My TBR list grew considerably on this Scavenger Hunt. Several titles were already on the list and many more added, Going To the Dogs, Leaving Yesterday, Starts with a Kiss, Waking Amy, Provoked. I am dying to read this! It sounds fantastic! Starts with a Kiss by Jane Lynne Daniels seems interesting. I'm checking out the whole series. There's a few more I've been wanting to read, like Felice Stevens' books, Wasley's Downfall, and the romantic suspense titles. There were a bunch a great books. Two that I definitely want to read are First Light and Crystallum! Some of the books I'd like to read are The Greek's Ready-Made Wife, A Royal Baby Surprise and several others. Some of the books I found in this contest that I want to read include: A Pirates Revenge, The Greeks Ready Made Bride, First Light, A Duchess in Name, and so on. There are so many books that I want to read: A Pirate's Revenge by Meg Hennessy, What Lies Between Us by Felice Stevens, The Greek's Ready-Made Wife by Jennifer Faye, A Royal Baby Surprise by Cat Shield, Provoked, Pushed, and Persuaded by Riley Murphy, Relentless by Skye Jordan, What the Duke Wants by Amy Quinton, and Gunning for the Groom by Debra Webb just to name a few. ...there are a ton of good books being introduced. The book I'm most intrigued by though is Duchess in Name. Looks like some great reads in this list! I am really looking forward to read A Dutches in Name, it sounds like my kind of read. On Mar 29, 2016, zuagy said: More books for my TBR list! I want to read books by Jennifer Faye, Vanessa Liebe, Amy Quinton, Cat Schield, Laney McMann, and Julieann Dove. On Mar 29, 2016, Tara W said: I found some great new books! I can't wait to read Strategic Alliance by Vanessa Liebe and Trapped by Alison Aimes. Many good choices, but especially The Fearless Highlander by Amy Jarecki, Tested By Her Web Master by Normandie Alleman, Relentless by Skye Jordan, and Wulfgang by Erin M. Leaf. On Mar 28, 2016, Bamaforever said: so many good books! I'd love to read Going to the Dog's Boxset, Wild Man's Curse,The Greek's Ready-Made Wife, and many others! A few of the books that intrigued me were Wulfgang, Second to None and The Dragon in the Garden. On Mar 27, 2016, ELF said: Great titles to add to my TBR mountain! There are so many intriguing stories that I am interested in, including Zoe Dawson's Going to the Dogs, Erin Leaf's Wulfgang and Diana Layne's Edge of Trust plus many more! I read all Jennifer Faye's work -- love her writing! -- and love romance but I also love paranormal, mysteries, suspense (if there is not a lot of what I consider gore)...not really a teen book reader. It's not because they are "bad" but they are just too young a read for me. Thanks for the contest! The books I found on this hunt that I want to read are Her Web Master and Tested by Her Web Master both by Normandie Alleman. Oh so many sound great... liking The Greek's Ready-Made Wife by Jennifer Faye, A Royal Baby Surprise by Cat Schield, and The Fearless Highlander by Amy Jarecki. This sounds so interesting that I am going to search for it now! On Mar 25, 2016, Lashea said: I love romance. Cat Schield and Lizbeth Selvig are two of my favorite authors. It's hard to choose. There are so many I want to read, but I'll probably begin with Doors. The books I'd start with are: The Fearless Highlander, Waking Amy, and The Greek's Ready-Made Wife. On Mar 23, 2016, chrisinwi said: a great way to find new reads! love this site, gives me everything I need great author chats, new reads, and games to play! A Pirate's Revenge looks like a great read! I noticed several books by Harlequin. Nice to see since I started reading their romance novels 50 years ago! I would also like to try some of Riley Murphy's work and also the vampire novel by Vanessa Liebe. I really want to read the door, but there are so many others that look incredible. Thanks for the fun giveaway and I can't wait to read some of the books listed here. One of them I plan on reading is Zoe Dawson's Going To The Dog's book set! I really enjoy reading everything, but I'd like read Relentless by Skye Jordan and Edge of Trust by Diana Layne, thanks so much for the chance!! On Mar 22, 2016, MdotDrizzi said: These sound awesome! I am looking forward to reading Waking Amy, Downfall, and Punishment Summer. I’m looking forward to read The Fearless Highlander, A Duchess in Name, and Trapped. I am looking forward to reading, A Pirates Revenge. However; all of these books look amazing. The Greek's Ready-Made Wife, A Duchess In Name, A Royal Baby Surprise, The Fearless Highlander, What The Duke Wants, Trapped, and The Bride Wore Starlight. What a wonderful selection of books! Wild Man's Curse by Susannah Sandlin, The Dragon in the Garden by Erika Gardner, and What the Duke Wants by Amy Quinton have really caught my interest. Thanks for sponsoring this great scavenger hunt. On Mar 20, 2016, Kittybooboo13 said: Which one? All sound good, but I can't decide which one to read first!! lol Something that DID catch my eye was "The Shiva Syndrome" by Alan Joshua, sounds promising. Lots of great sounding books listed in this scavenger hunt. I especially can't wait to read: The Greek's Ready-Made Wife by Jennifer Faye; A Royal Baby Surprise by Cat Schield; The Bride Wore Starlight by Lizbeth Selvig; and Starts With A Kiss by Jane Lynne Daniels. On Mar 20, 2016, MJSymmonds said: Just to list a few. Would love to read The Greek's ready made wife, Provoked, Pushed & Persuaded, Relentless just to name a few. Thanks. I'd love to read Fear Of Falling! It looks like a great read! Tested by her Webmaster and Confessions of a Punk Rocker seem really good! Zoe Dawson is my new author dejour. Going to the Dogs & Leaving Yesterday are my new reads. Love these hunts- new books, new authors!!!! Well to answer your question, I found it very difficult to narrow down which books I liked the most but I will try. I would love to read the The SHIVA Syndrome by Alan Joshua. The Champion of Barésh (Star World Frontier Book 1) by Susan Grant and A Deadly Truth Joyce Proell. Honestly, I would love to read all the books that are here but for now, those interest me more. Thank you so much for the wonderful giveaway. Fingers crossed. The one that caught my eye and interest the strongest was The Bride Wore Starlight! On Mar 18, 2016, Ginnylou said: Great contest! As a reader of romance there are a lot of great books here. A Pirate's Revenge, Tested by Her Web Master, A Duchess in Name, A Royal Baby Surprise, all 3 by Riley Murphy, The Fearless Highlander, Handled by Officer, Relentless, What a Duke Wants, and The Draig's Woman are now all tagged 'To Be Read' for me. I downloaded and plan to start Trapped immediately. On Mar 17, 2016, dawnmoneque said: Stacked up my TBR list! I found several books here I just added go my wish list. Felice Stevens was one author, but there were several others that have me wishing I could read several at once! Great list of books! On Mar 17, 2016, righinnk said: Wonderful Authors - Thank you!!! First, let me say Thank You again for always posting the most generous giveaways and introducing me to some fabulous new authors. My first pick: CRYSTALLUM (The Primordial Principles Book 1).. Rock on Night Owl!! Woo Hoo! I love doing this savage hunt learn about new books and new authors. On Mar 16, 2016, Eellwyn said: Great hunt! I want to read many of these books! Some of them i already had pleasure to read! For example: i loooooved Downfall by S.D Wasley. Amazing book! I'm looking forward to reading Amy Quinton's book, A Pirate's Revenge & a few other historicals. On Mar 15, 2016, gecko said: Old favorites and new favorites! I'd like to read the books from Skye Jordan and Zoe Dawson! Trapped and A pirate's revenge are some books I would like to read. On Mar 14, 2016, Bookfreak said: Well! Thanks for making my TBR list all that much longer NOR!!!! Just kidding, I love it when I find amazing new authors and when I see some that I already love! This is awesome! So many new authors to me. I have a list of books I want to get now. Thanks for the chance. On Mar 14, 2016, booksforme said: Great books for spring fling! Handled by Officer and Relentless are on the top of my list although all the books sound good! A few of the books that I would like to read are The Greek's Ready-Made Wife by Jennifer Faye, A Duchess in Name by Amanda Weaver and A Royal Baby Surprise by Cat Schield. Always love finding new authors to read. The contests are fun too. I don't win very often, but they are still fun. Can't really decide. I know I definitely want to read Trapped and The Fearless Highlander and The Dragon in the Garden. They all sounds good. My favorite TBR on this list is Liz Selvig's The Bride Wore Starlight. Thanks for the giveaways. On Mar 13, 2016, KChorak said: Love the Hunt! I love these hunts. I always find new authors to try out. I can't wait to read The Greek's Ready-Made Wife by Jennifer Faye. On Mar 13, 2016, carolynlmc said: Many good books! I love this contest!! I like The Fearless Highlander, A Duchess in Name, The Dragon in the Garden, What the Duke, Wulfgang, so many good books!! On Mar 13, 2016, Sylvie said: So Many Books! I love these scavenger hunts! I always find new books! This time, I'm looking forward to reading Strategic Alliance, Second to None, What Lies Between Us and Confessions of a Punk Rocker. The Bride wore Starlight, sounds interesting , and I saw a couple more books I would like to read. Thanks. On Mar 13, 2016, cmmccoy said: love these events! I have so much fun with this! Thank you! On Mar 13, 2016, Truanimefan said: So many books. . . . . . . There were so many great books in this scavenger hunt that look interesting. I've already read a couple, and I look forward to making my way through the rest of them. looking forward to checking out Susan Grant, Amy Quinton, Erika Gardner, Laney McMann, Tami Lund and Vanessa Liebe. Thank you for the leads andgreat competition! What the Duke wants; Duchess in name; Leaving yesterday; Bride wore starlight; Handled by officer; Relentless. migh thave to retire sooner than planned! I just love the diversity of the books in each scavenger hunt. Thanks! I have found a few new authors and books to add to the list to read. 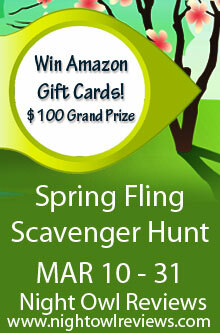 The Spring Fling Scavenger Hunt was fun. I am looking forward to A Fearless Highlander by Amy Jarecki, A Duchess in Name by Amanda Weaver, What the Duke Wants by Amy Quinton. On Mar 12, 2016, thewildtwo said: Oh my goodness! How wonderful! A fun scavenger hunt and MORE books to purchase! Happy day to me! ;-) I plan to get the the Make Me series(and the others that I found!) by Riley Murphy. And Sky Jordan's Relentless. Oh, and The SHIVA Syndrome by Alan Joshua looks interesting. And.....lordy....so many!! I love these scavenger hunts. I always find so many new books. There are so many great reads here. The Fearless Highlander, The Draigs Woman, and What The Duke Wants are books I definitely want to read. On Mar 12, 2016, joytoread said: Spring Fling Hunt! I found some great books including The Bride Wore Starlight by Lizbeth Selvig, A Deadly Truth by Joyce Proell and A Pirate's Revenge by Meg Hennessy. These Hunts are fun! New books, new authors! I always love getting to know new authors....my wishlist is gonna keep growing. Amy Quinton What a Duke Wants and the previous one both sound interesting, will add to my must get and read list. I want to read The Champion of Barésh by Susan Grant. I love her books. I'd like to read the Grantham series. Sounds like stories I'd enjoy. I found many books I would like to read including Wulfgang, Second to None, Living Dead and What lies between US. I had many more on my list but not enough room. I think Tested by Her Web Master by Normandie Alleman; The Greeks Ready Made Wife by Jennifer Faye and A Duchess in Name by Amanda Weaver all sound really good. On this hunt I found two books that interest me, Leaving Yesterday by Zoe Dawson and The Champion of Barésh by Susan Grant. I'm excited about A Duchess in Name, Wulfgang and The Fearless Highlander. Thanks for this awesome giveaway and a peak at all these great books! I am looking forward to reading "Tested by Her Web Master", "Wild Man's Curse", "A Duchess in Name" and "What the Duke Wants"
Pirate's Revenge, The Duchess in Name, The Royal Baby Surprise,The Fearless Highlander,What The Duke Wants,The Draig'w Woman,Gunning for the Groom,The Bride Wore Starlight. All sound like wonderful reads. So many books to choose from. I wont list all the ones I want to read, just a few. "Tested by Her Web Master" "The Greeks Ready Made Wife" "First Light" "Downfall"
On Mar 11, 2016, HaddieHarper said: I saw several authors . . .
Amanda Weaver! I loved "This Book Will Change Your Life"! Title said it all! Skye Jordan and Susannah Sandlin are two of my favorite authors! I would love to try Amy Jarecki and Meg Hennessey. There are so many books that look awesome. The Dragon in the Garden is one I definitely want to read. On Mar 11, 2016, DarkSoul said: Things I'd like to read! All of these books look awesome! And I can't wait to read them! But the #1 on my list will be Her Web Master! On Mar 11, 2016, marybelle said: Thank you. Always so much fun thank you. Love adding to my reading list. On Mar 11, 2016, amandastar said: Thanks! Great scavenger hunt! I'm going to be checking out Relentless by Skye Jordan The Greek's Ready-Made Wife by Jennifer Faye. On Mar 11, 2016, Tamazon said: Awesome! I always love these giveaways because I can find out about all the newest authors. I saw several books, Vanessa Liebe, Riley Murphy, Zoe Dawson and Erin M. Leaf are the authors that have books I would love to read. I love how I am able to read about new authors. On Mar 11, 2016, CandyLyn said: Very excited for this awesome group of books! I didn't know Skye Jordan came out with Relentless! #4!!! The Royal Baby one looks fantastic. The Greeks Ready-Made Wife I already have thanks to the generosity of a certain person! There's a ton of books that I would really love to have in this list and I look forward to collecting them one by one! I found books by Felice Stephens and Riley Murphy that I will be checking out. I love Zoe Dawson and found one I hadn't read. They all sound interesting and I found quite a few books for my reading list. Summer Fling, and Jennifer Faye's book. Goodness - I would like to read just about all of them. Another one I would like to read. Thanks for the contest . I like these scavenger hunts they are fun to do. Lots of books I found out about to. Sounds like a book I would enjoy reading . On Mar 10, 2016, lilallykitten said: So Many Great Reads! My TBR List Will Totally Be Full Now! LOL! Wow! So many books that I am excited to check out and read! The top three books that I am most interested in are "Waking Amy," "The Greek's Ready-Made Wife," and "A Royal Baby Surprise." On Mar 10, 2016, pixiestyx said: So many great books! I love these scavenger hunts! I always find new books to check out. I've actually read Crystallum by Laney McMann, and it's amazing. I'm looking forward to checking out Punishment Summer and Downfall. On Mar 10, 2016, amyjarecki said: So Many Beautiful Covers! I love the NOR Spring Fling! So many great prizes. Good luck everyone and thanks for the mentions! I would love to read the books by Riley Murphy that I found. I cannot wait to read Fearless Highlander by Amy Jarecki!!! Several new authors for me. I look forward to reading Amy Jarecki, Amanda Weaver, Cat Shield, and Meg Hennessy. I would like to read a lot of these books. Like Relentless by Sky Jordan. Thanks for the chance! The Breakfast Club collection by Felice Stevens, Tested by Her Web Master, a Royal Baby Surprise, The Make Me series by Riley Murphy, Waking Amy, Summer Fling and Going to the Dogs Started all seem very promising to me! Already added to my list to-read! On Mar 10, 2016, msdebms said: Bring on the Scots! "Draig's Woman" by Lisa Dawn Wadler looks very interesting to me. Bring on the Scots! CRYSTALLUM, Downfall (which I already own) and Punishment Summer.